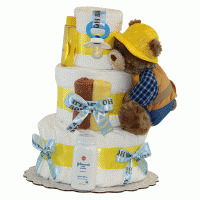 Our attractive and practical diaper cakes for baby boys make wonderfully unique new baby gift ideas - express your congratulations to the new family and help out with diapers at the same time! 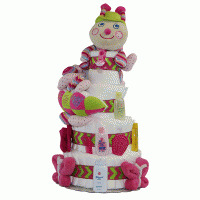 If you want a creative and memorable gift for a baby shower, a diaper cake is guaranteed to steal the show. Browse our baby shower ideas for boys for more suggestions for baby boy showers. 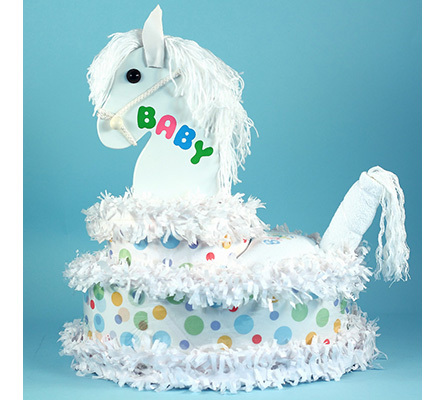 My Little Pony Diaper Cake is the latest in a long line of unique baby gifts from Silly Phillie. 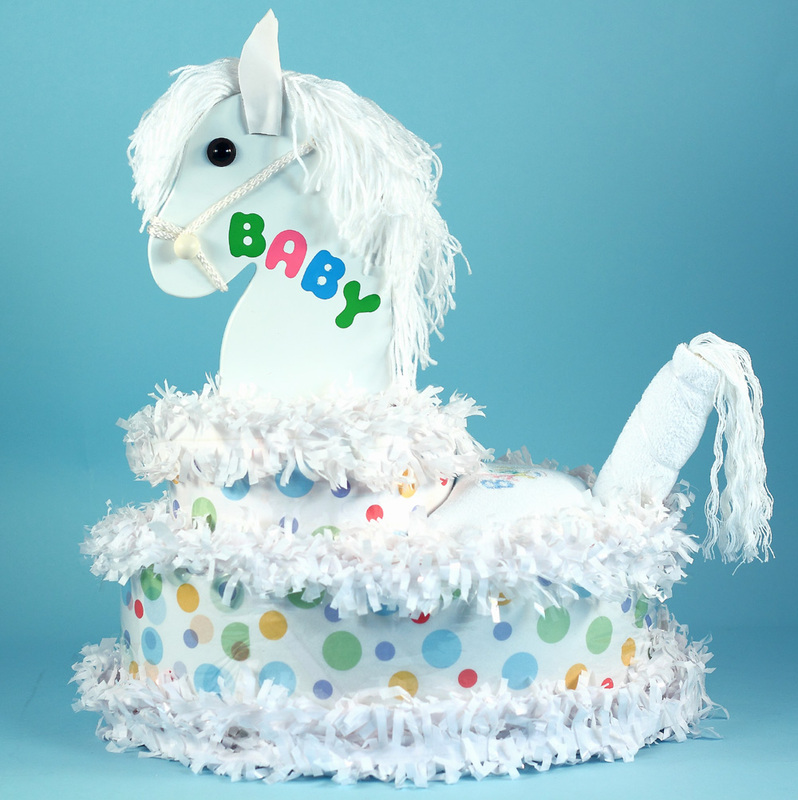 It is an inspired interpretation of the classic diaper cake, majestically topped off with a keepsake wall plaque in the shape of a pony's head. The plaque is made of wood, embellished with the word "BABY", and can be easily hung as wall or door art in baby's room. 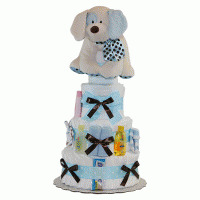 This is a stunning gift suitable to welcome either a newborn baby boy or girl. It's impressive size and gender neutral colors make it ideal also as a baby shower gift or baby shower centerpiece. My Little Pony Diaper Cake Contents-Grand Version 7" x 10" pony head wood wall or door plaque decorated with "BABY" 24 newborn sized diapers-Made in the USA Hooded terry towel-Made in the USA Baby bib embroidered with "Baby"-Made in the USA Terry burp cloth-Made in the USA Size & Presentation As noted above, My Little Pony Diaper Cake is a large and impressive gift as it measures 18" x 16" x 18" tall. To ensure gift arrives looking sensational, all components are creatively and securely attached to a custom designed diaper care form, then carefully packaged for shipping. My Little Pony Diaper Cake-Deluxe Version For those looking for an even more amazing gift, feast your eyes upon the deluxe version shown in the photo beneath the main product image. In addition to all items listed above, the deluxe version also includes: Knitted shawl baby blanket knitted shawl sweater & hat set Knitted booties Terry burp pad In typical Silly Phillie� style, these aditional items are presented as a baby riding on My little Pony...Absolutely priceless! The deluxe version can be ordered at an additional $30.00 cost simply by choosing that version in the drop down box above.